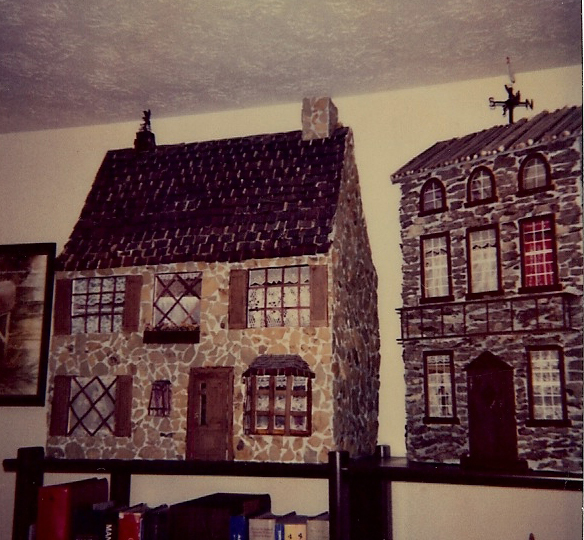 These are images of my first attempts at building dollhouses starting in 1975. 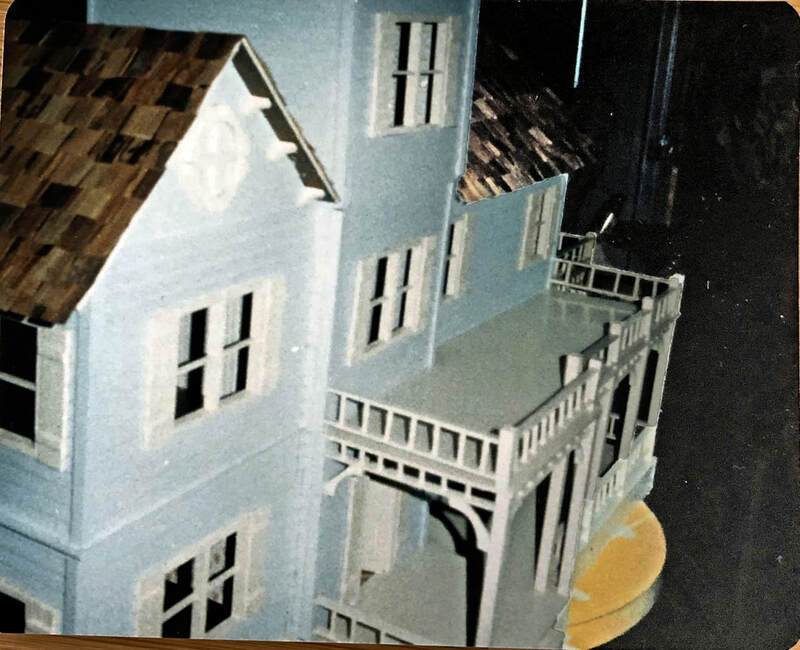 Some are constructed from kits, some are from scratch. Obviously, I had a lot to learn! 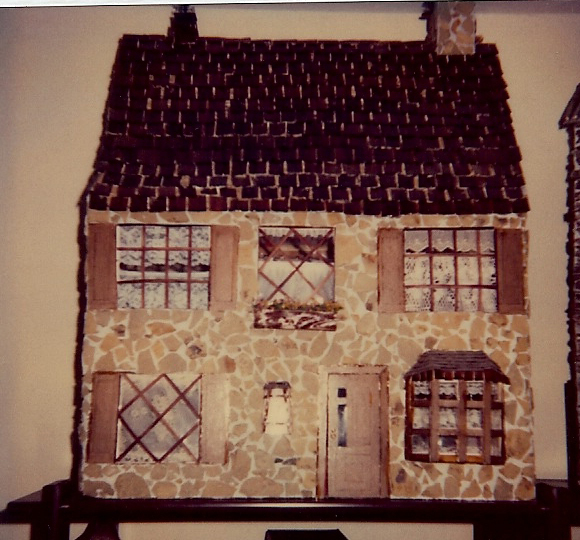 This is my very first wooden house built in 1975. My dad and I built it from some scraps of plywood. I didn't understand that the thickness of the wood used in construction affected the scale. 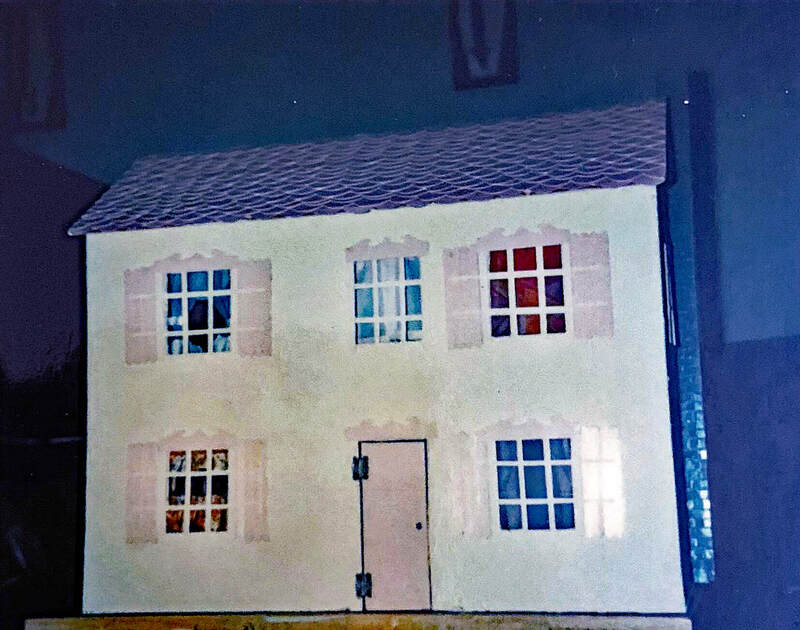 This house no longer exists. This house is very rudimentary by today's standards. 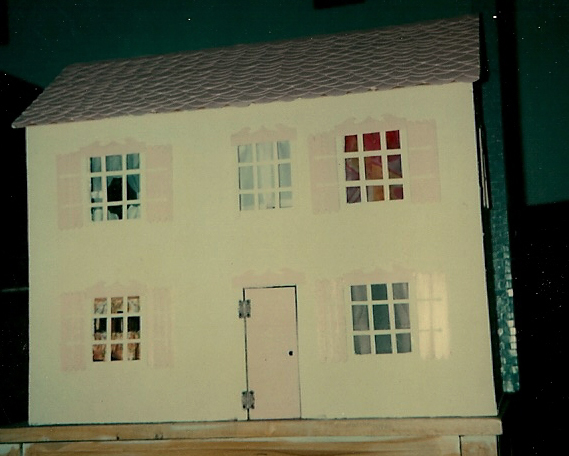 The roof and window trim are made of cardboard painted pink. 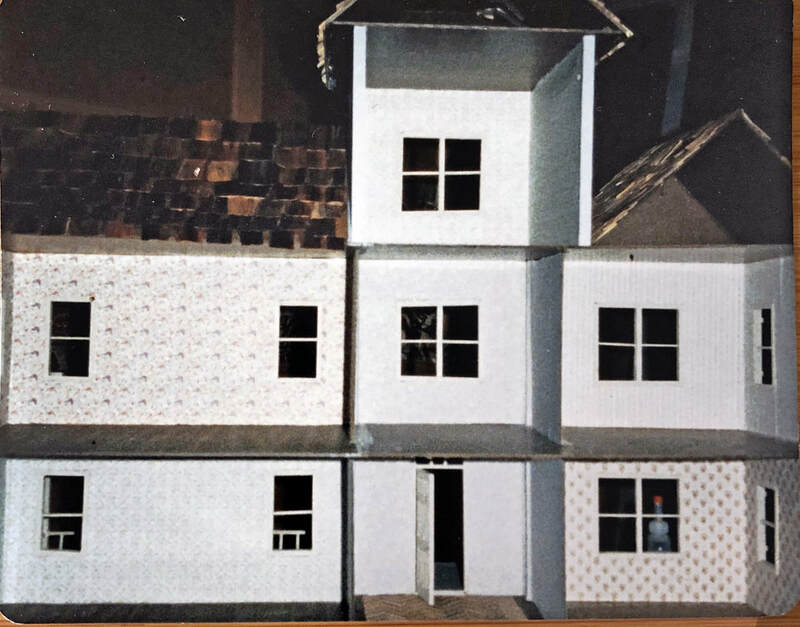 The wooden chimney is covered with small cutout cardboard painted gray. 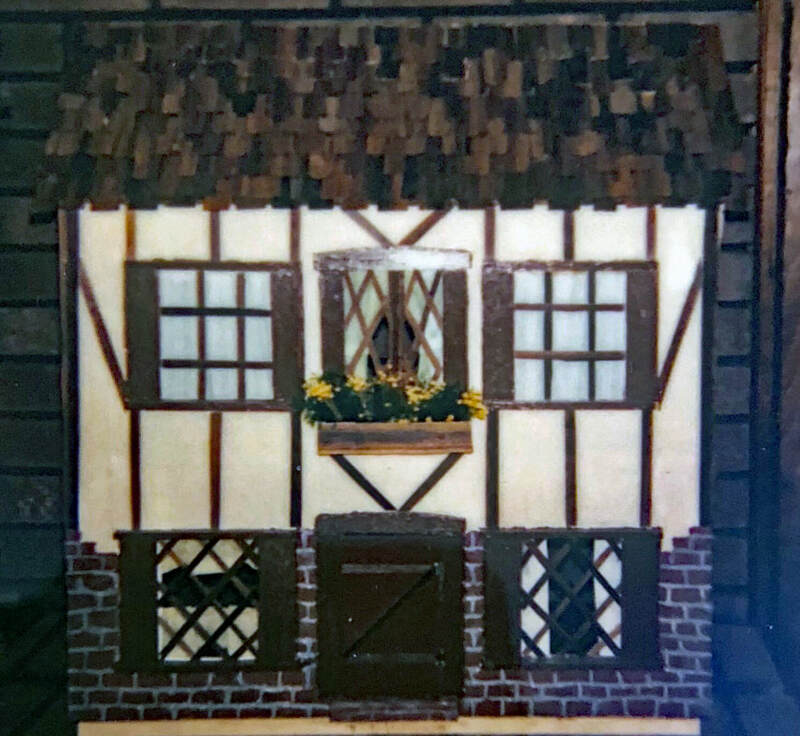 The shutters are made of ice cream sticks. 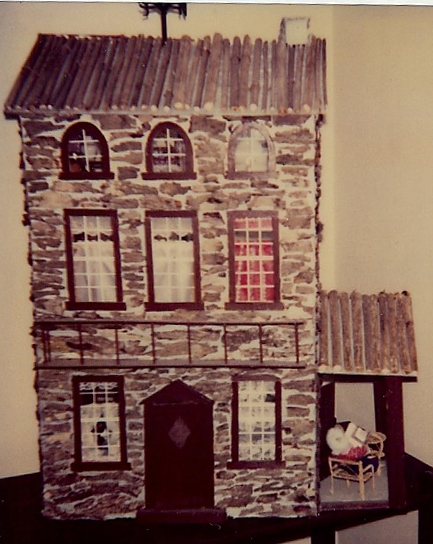 The interior of the house contains mostly handmade furniture. The rugs are scraps of carpet. 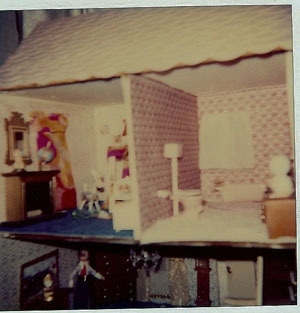 The brightly dressed bed in the upper left bedroom is made from ice cream sticks. 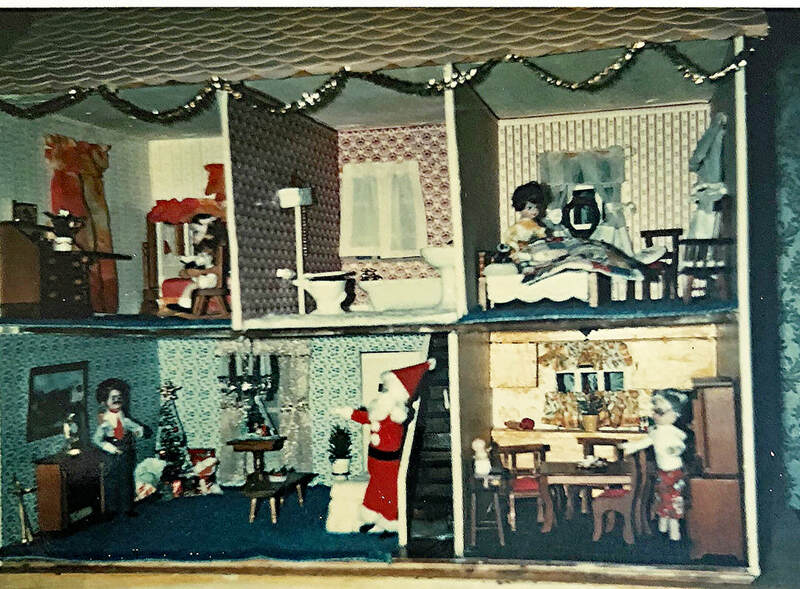 The Santa Claus and dolls were made from pipe cleaners. I made the quilt in the master bedroom, my last attempt that quilt making! The lower yellow cabinets in the kitchen are built in and have no working drawers or doors. The painting over the fireplace is an original acrylic landscape. The staircase is made of small pieces of wood squares, nailed together. My dad, who helped me build the house, was very concerned that the staircase wasn't very sturdy. I had to remind him that only dolls would be walking up it. This was an attempt to create a log house using some tree bark and twigs. 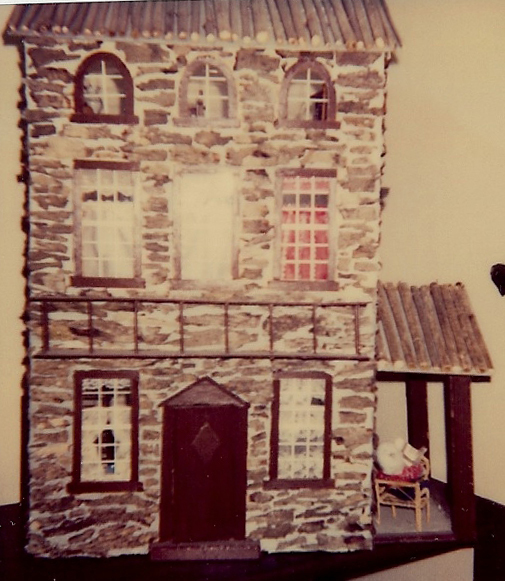 The house was constructed from an Arrow kit in 1976. It no longer exists. Unfortunately, there are no pictures of its interior. 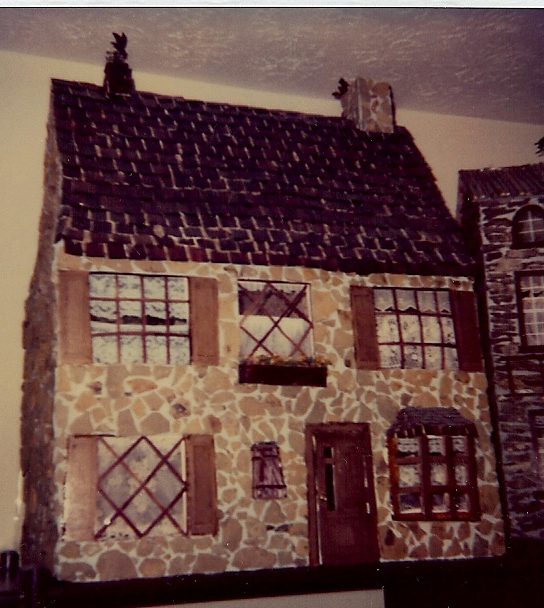 This house was made from a large cardboard box that once held toilet paper, with real stones attached using spackling paste. Amazingly, it held up! 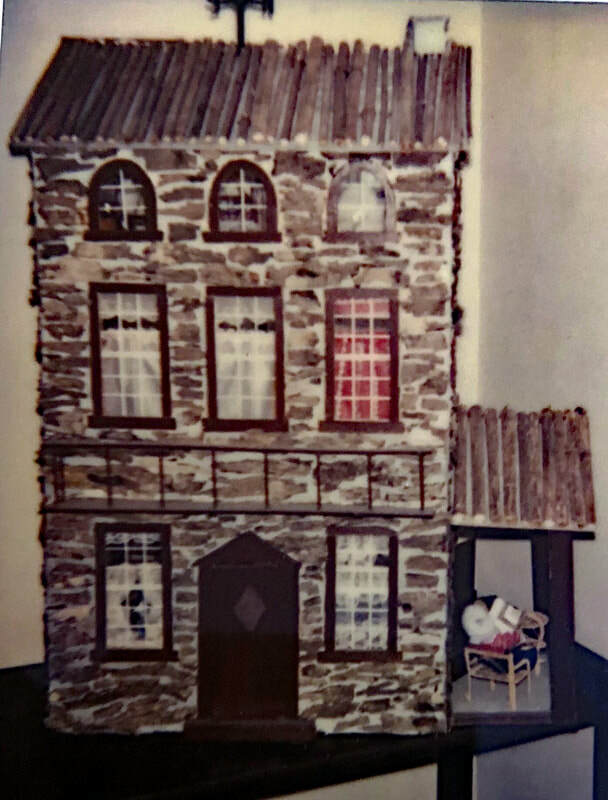 Eventually, this house was given to a neighbors grandchildren. 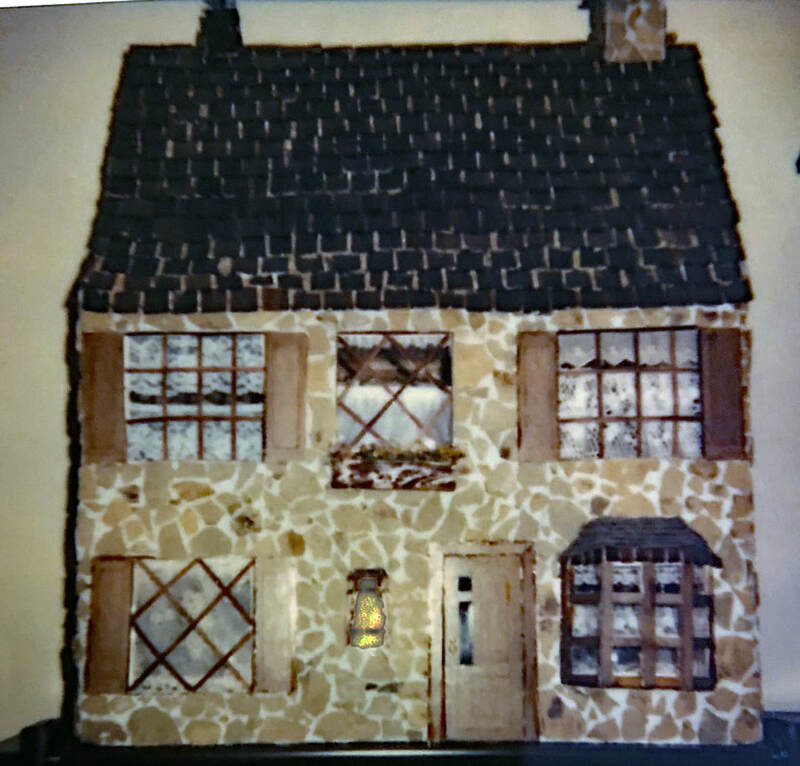 The door, shutters, window frames, the little front lantern are all made from cardboard. It was covered with slate stone pieces, thus the left side roof concave issue. The roof shingles were cut from a strawberry basket. This was a massive house. No interior pictures exists. 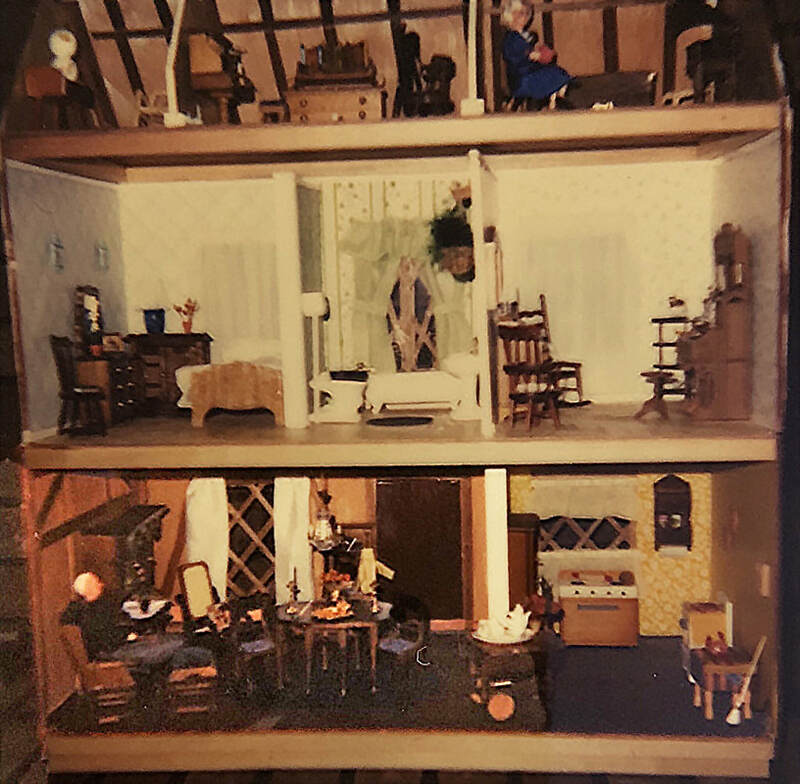 I found a sale on Arrow dollhouse kits ($10) and bought two kits, which I combined. 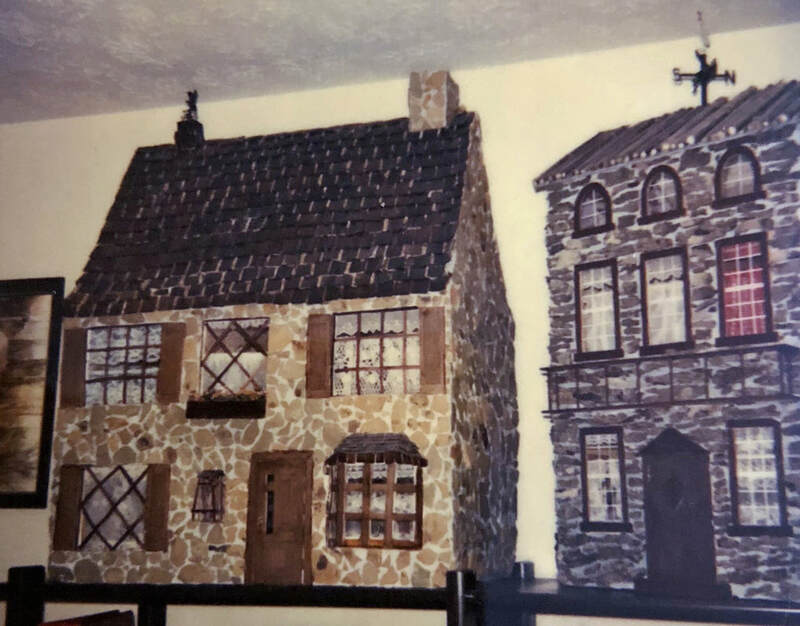 These houses from these kits had only one level, so I use one dollhouse kit on top of the other to mad a second floor. The roof is made from a cut up basket. The foundation was etched in spackel and painted to look like brick. My favorite Aunt Rachel bought this house when she was traveling in Canada. The instructions were in English, but the parts were only identifiable by their measurements, which were in metric! I was 7 months pregnant with my first child when I built it for her. She sat by the table and watched the whole process. 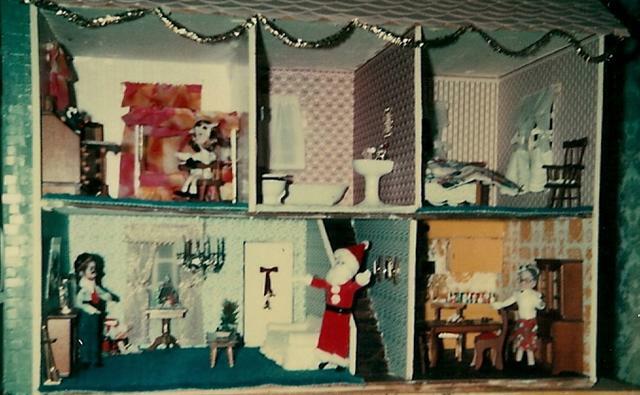 My aunt has since passed away and this house was given to one of her granddaughters. 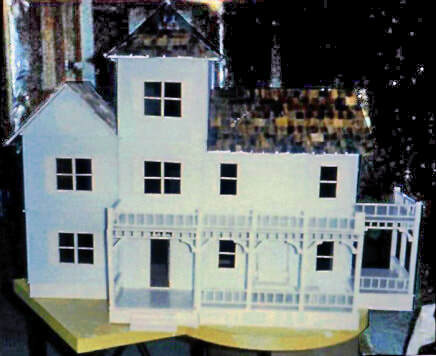 The house was a lovely shade of blue. I wished I had better pictures of it. It was a beautiful house. It was the most challenging kits I'd tackled at that time. Everything had to be assembled, even the windows. 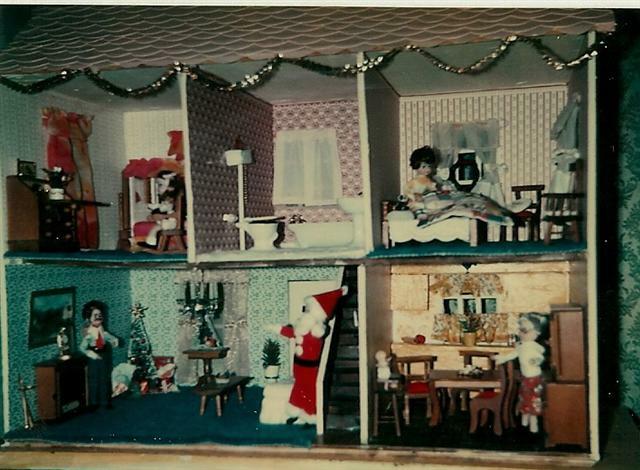 This was the first time I'd used real dollhouse wallpaper. In the past I'd used wrapping paper on the walls.